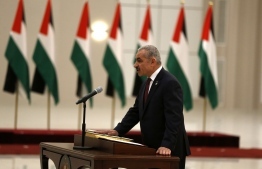 Incoming Palestinian prime minister Mohammad Shtayyeh announced his new cabinet Saturday alongside president Mahmud Abbas, leaving outthe Islamist movement Hamas. Several key positions were unchanged from the previous administration of Rami Hamdallah. Analysts say the change of government was made to further isolate Hamas, which has been at odds with the Fatah party of Abbas and Shtayyeh for more than a decade. They say 84-year-old Abbas, in power since 2005, retains the real decision-making authority. In a statement Saturday night, Abbas confirmed the new government and welcomed the cabinet. It includes many of his long-time allies and members of Fatah, though several smaller factions are also represented. Other parties, including the Popular Front for the Liberation of Palestine, refused to take part, calling for a unity government of all factions including Hamas. The Islamist movement controls the Gaza Strip, while the Palestinian Authority headed by Abbas is based in the West Bank, where Israel also maintains a military occupation. Shtayyeh's government replaces a technocratic administration which had the nominal backing of Hamas and all other Palestinian factions. Atef Abu Seif, a Palestinian from Gaza who was badly beaten by a group of men in the Hamas-run enclave, will become culture minister. Abbas charged Shtayyeh with forming a new government on March 10. The United Nations envoy for the Middle East, Nickolay Mladenov, welcomed the lineup. "The United Nations remains fully committed to working with the Palestinian leadership and people in ending the occupation and advancing their legitimate national aspirations for statehood based on UN resolutions," he said in a statement. Hamas and Fatah have been at loggerheads since the Islamists seized control of the Gaza Strip in a 2007 near-civil war, a year after winning parliamentary elections. Palestinian politics has been effectively frozen since, and multiple reconciliation attempts have failed. Hamas has criticised the formation of the new government, accusing Fatah of a power grab. Hugh Lovatt, Israel-Palestine analyst at the European Council on Foreign Relations, said the new adminstration appeared to be "a continuation, rather than a radical break, from the outgoing Hamdallah government". "Despite the inclusion of technocrats and political figures from smaller left-wing factions, the new Palestinian government remains heavily stacked with supporters of President Abbas," he said. Former government minister Shtayyeh has been part of a number of Palestinian negotiating teams in US-brokered talks with Israel that have been suspended.